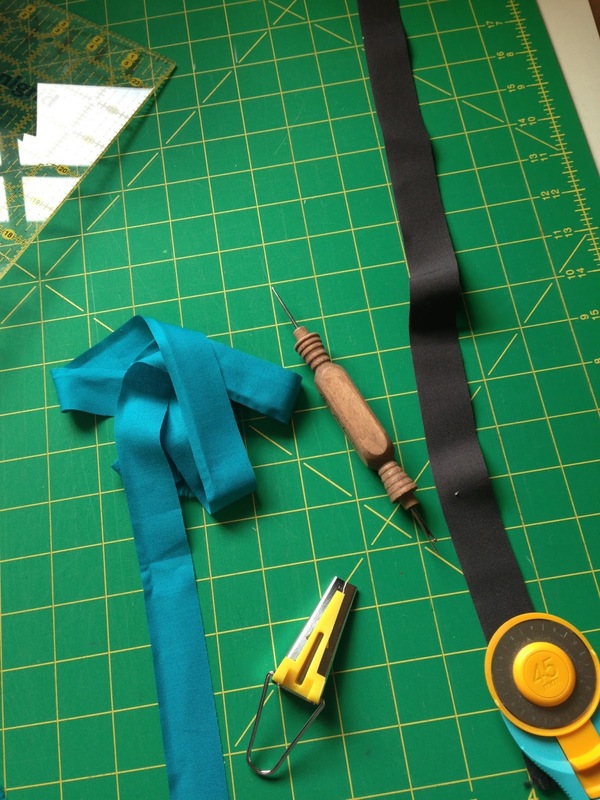 Today's my stop for the Back to School Blog Hop organized by fellow Portlander, Sam Hunter! 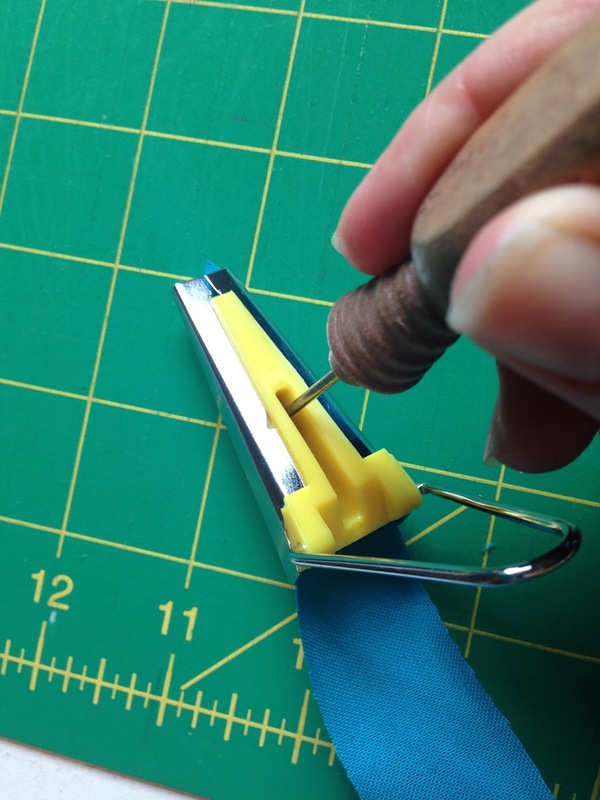 Oh quilting friends, do you hold onto beautiful little possibly-useful bits of things because you can't bear to throw them away? Do you stash and squirrel things away until that magical day that you know what to do with them? Well me too. 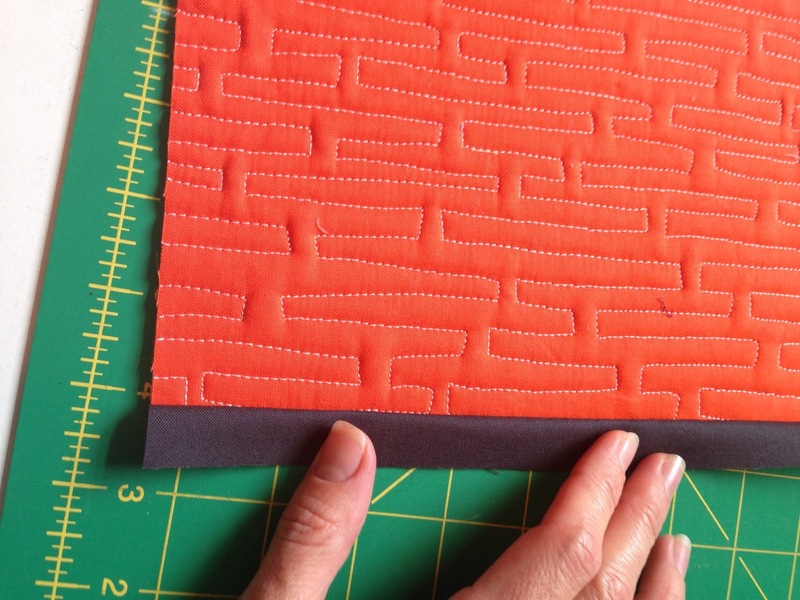 Exhibit A.
I do these quilted samples to record video tutorials for the blog, or they're samples from books, or Craftsy classes, or whatever. 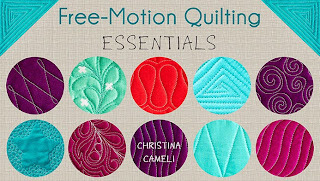 I create them to help me teach FMQ but after they're photographed, then what? I save them. The piles get bigger and then I realize, if I don't do something useful with these, you won't be able to tell me from a crazy hoarder! Am I crazy? Of course I am. But am I a hoarder? Not yet. 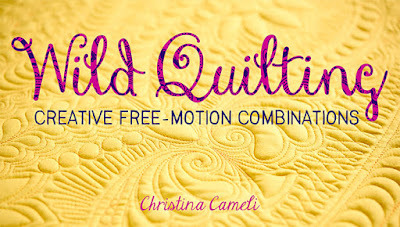 So if you are also trying to be a resourceful not-hoarder, my treat for you today is showing you how you can join your quilted pieces in a quilt as you go method, using only your machine. What, no hand stitching that last seam? That's right, you're welcome. In this tutorial you use 1" strips on the front and back to join the two quilted pieces. This has all been in my head for a while and luckily Sam Hunter got me off my booty to actually make the tutorial happen by inviting me to her Back to School Blog Hop. 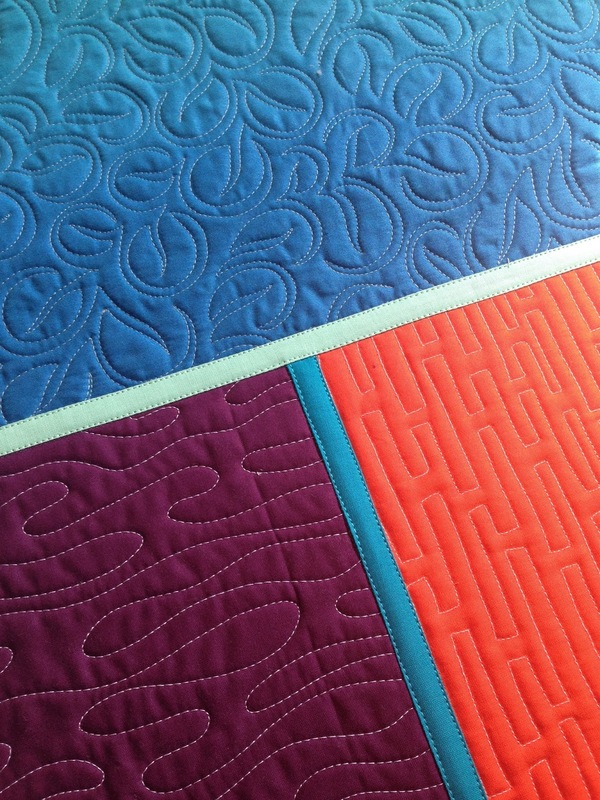 So here's how you join two quilted pieces. 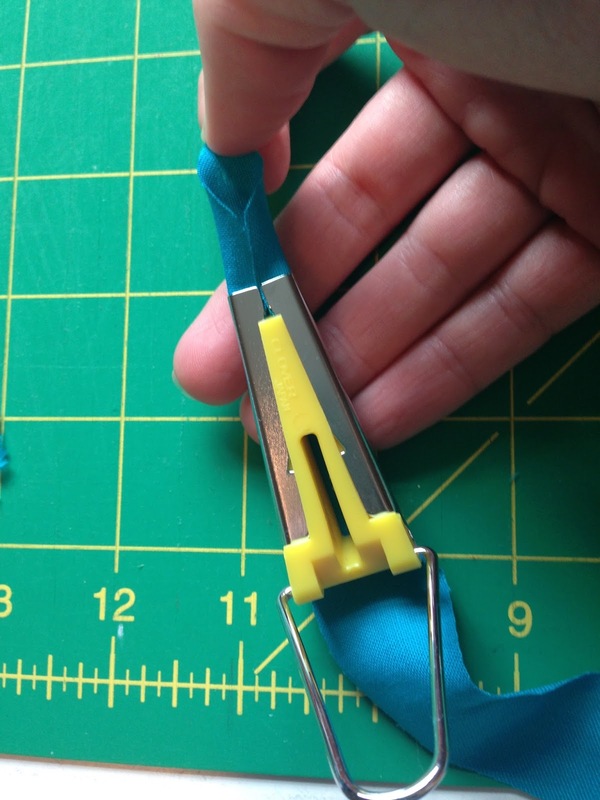 2 1" strips of fabric, cut these 1" longer than the side you are joining. 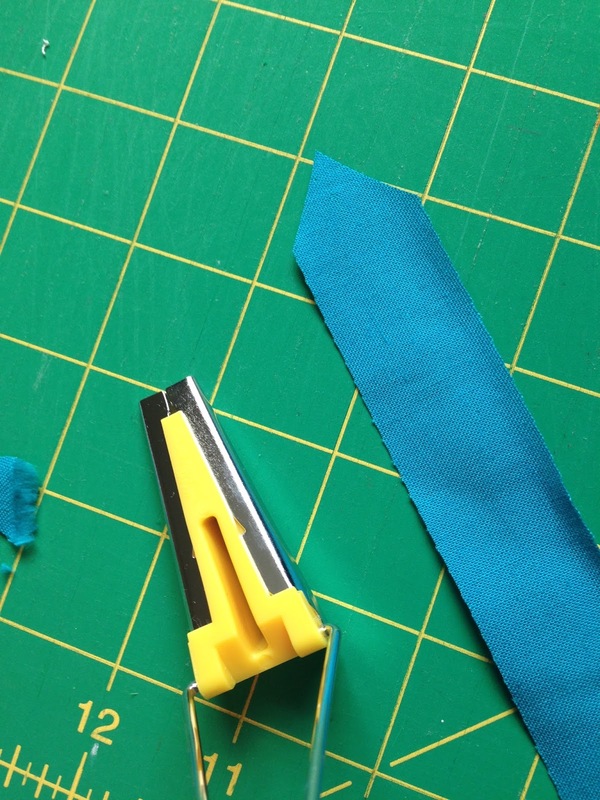 Start by running the 1" strip for the top of your piece through your bias tape maker (Don't do anything with the back strip!). 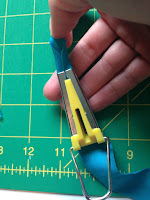 You might have to trim the edge a little as shown and use a pin or stiletto to get the leading edge through. 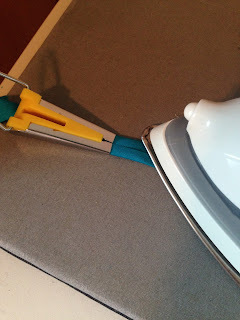 Press it, keeping the iron right next to where the fabric comes out. 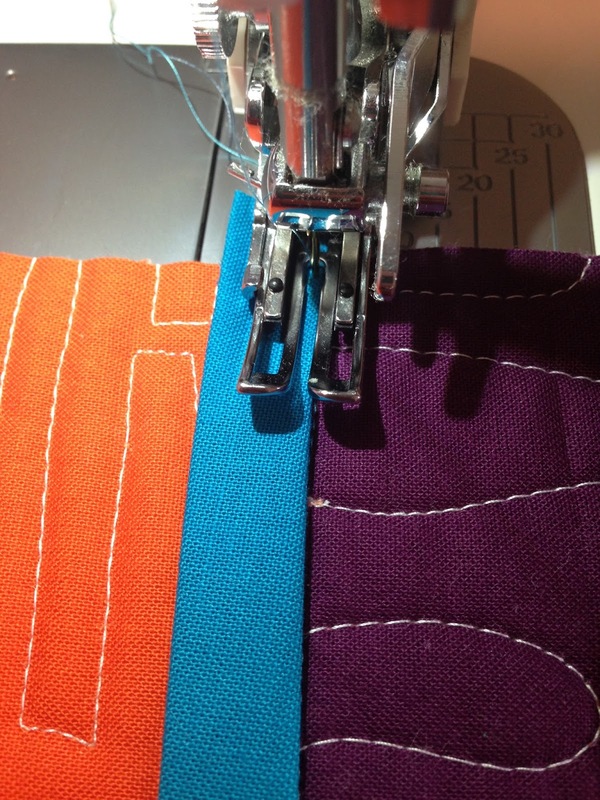 Now the sewing starts. Make sure you have your walking foot on. Use top thread that matches the color of your top strip and bobbin thread that matches the color of your back strip (in case they're different like mine are). 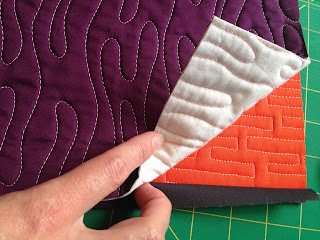 Lay the unpressed back strip face down on the back of your first quilted piece. 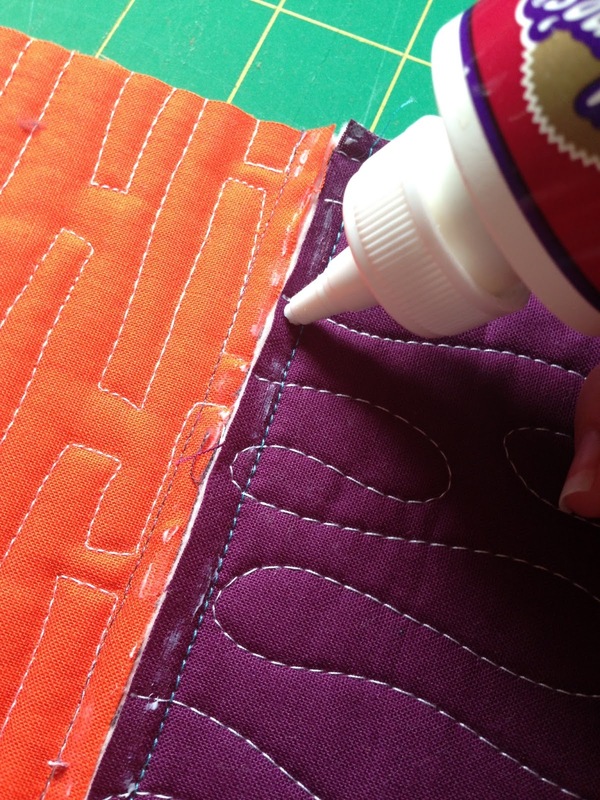 Join the unpressed strip to the quilted piece using a 1/4" seam. 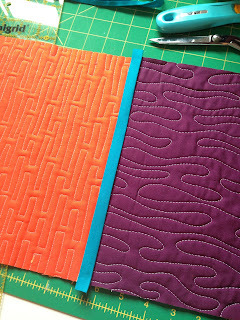 Trim the excess strip, then open the strip and lay the second quilted piece right side UP, aligning edges with the strip. 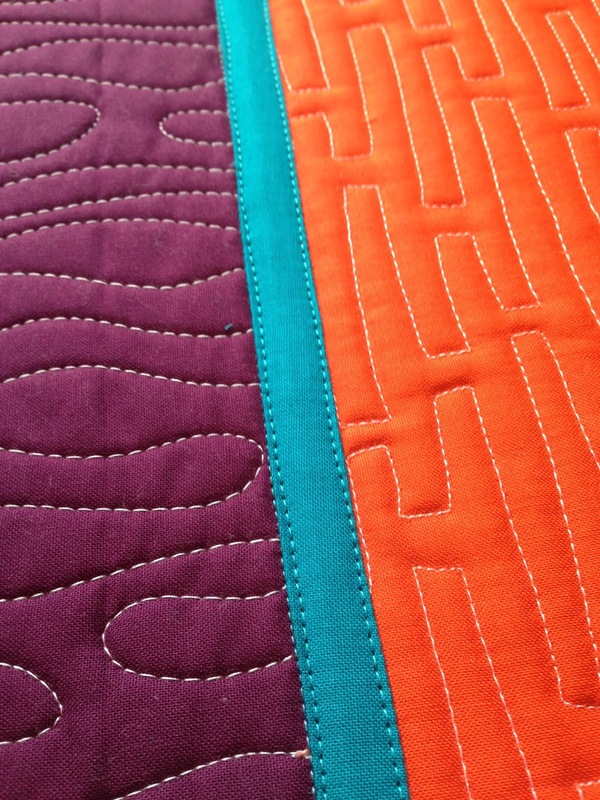 Join the strip and the second quilted piece using a 1/4" seam. Open the joined pieces and press. 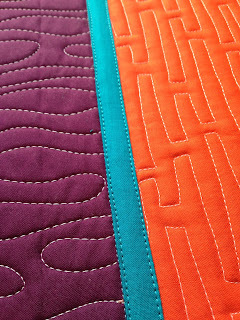 You should see that the raw edges of your quilted pieces just meet on the other (front) side. Now let's step away from the machine and do some gluing. How back to school is that? Very back to school indeed. The glue I use is Aleene's temporary hold glue. But when I can't find it I use white glue. 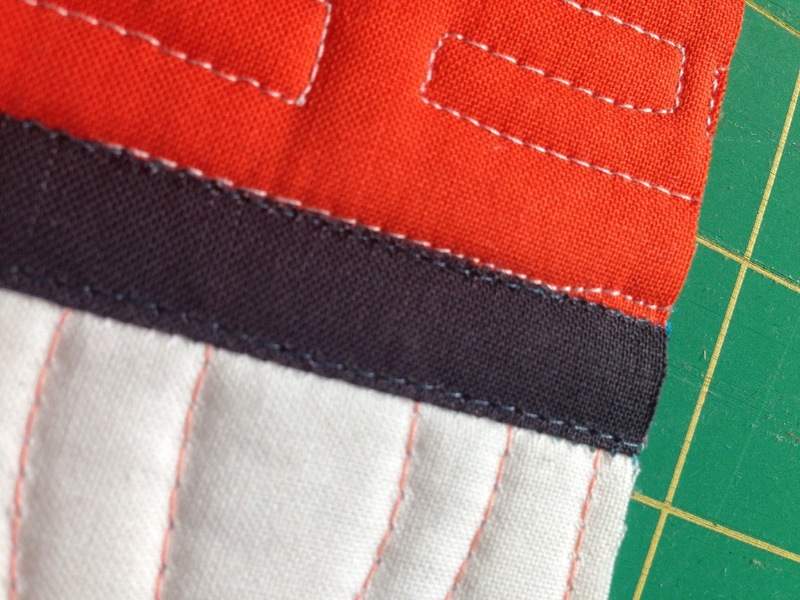 I put a little glue on those seam allowances (inside the stitching!) and lay the pressed strip down on the glue. I use the stitched lines as my guide to know I'm keeping the pressed strip centered. Let that dry, and take it back to the sewing machine. 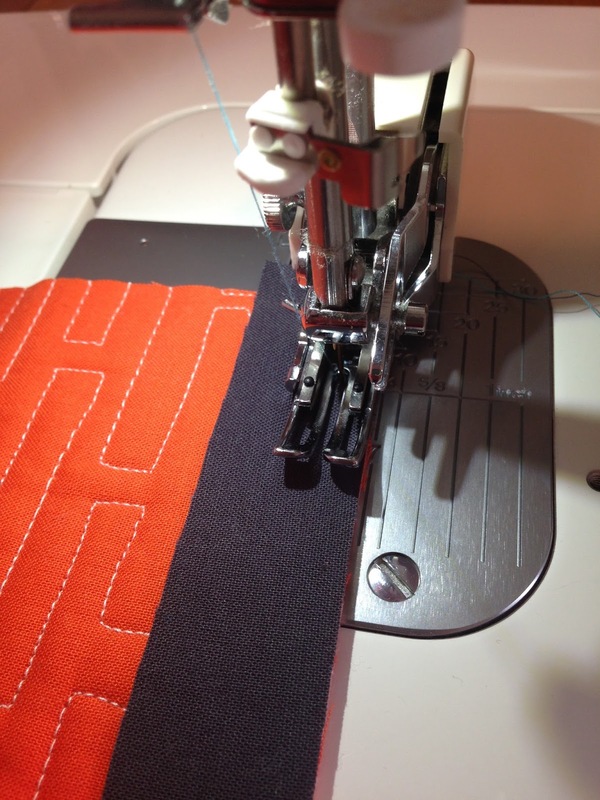 Now for the the final step: topstitching along the inside of both sides of the top strip. When you turn it back over, you'll see your stitching is right on that back strip too! Here's the lamentably unfocussed picture I took of that moment. Trust me though, it's magic. You can keep doing that over and over, building your piece bigger and bigger, until you have an entire quilt! 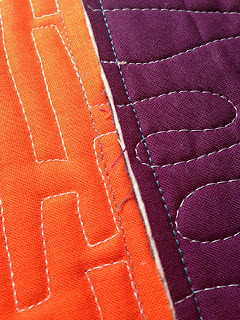 In the piece I am working on I am using different colored strips for the joining strips on the front so they don't look too predictable. The back I'm happy to leave all the same color so I don't need to change the bobbin thread. Variation: You could also do this with larger strips and larger seam allowances for a different look. 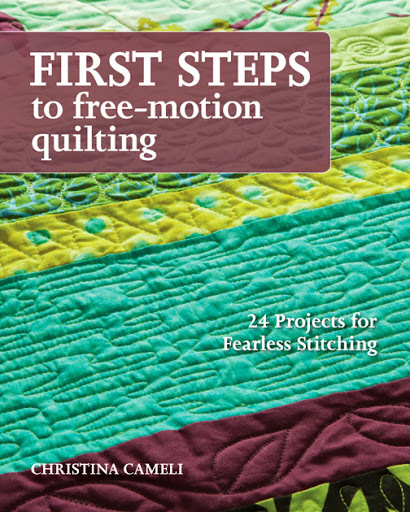 If you used 2" strips, a 1" bias tape maker and 1/2" seam allowances you'd have something like this quilt from my book First Steps to Free-Motion Quilting. Hopefully someday I'll have a few quilts to show from all these smaller pieces I've been stashing. Don't miss the other helpful posts on the Back to School Blog Hop, I've linked to them all below! Best wishes to you all. 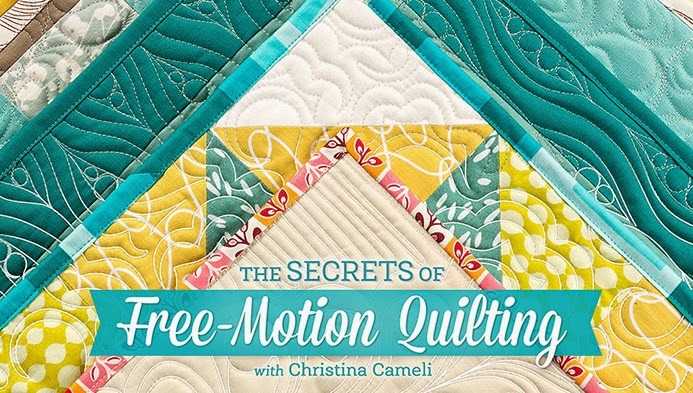 This is similar to the way I join pieces when I quilt in sections. I think I will try it this way to see which I like better. Thank you so much for this tutorial! I have never tried quilt as you go because I've never liked how it all finished (no quilting on the backing, weird joints, etc.) This is an awesome way to do this! I've always wondered how to do this. Thanks. This is FABULOUS!! Thank you. Gluing the top strip down is SO clever! I'm printing this one out. Thanks Christina! I can't wait to try this, Christina. I love filling up my tool box with your tips. This is genius, Christina! 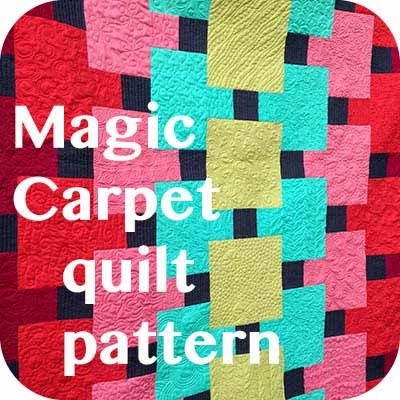 Makes a lovely quilt, too! Ooh thanks for sharing this! I used this method on a PMQG charity quilt last year (the strips were from a jelly roll donated by Cherri) but I kinda forgot about it. What a fabulous way to practice my free motion with your books right next to me ha! 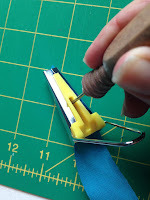 Also I didn't use glue when I did this before so I will have to give that a go! This is the best QAYG method I've ever seen! 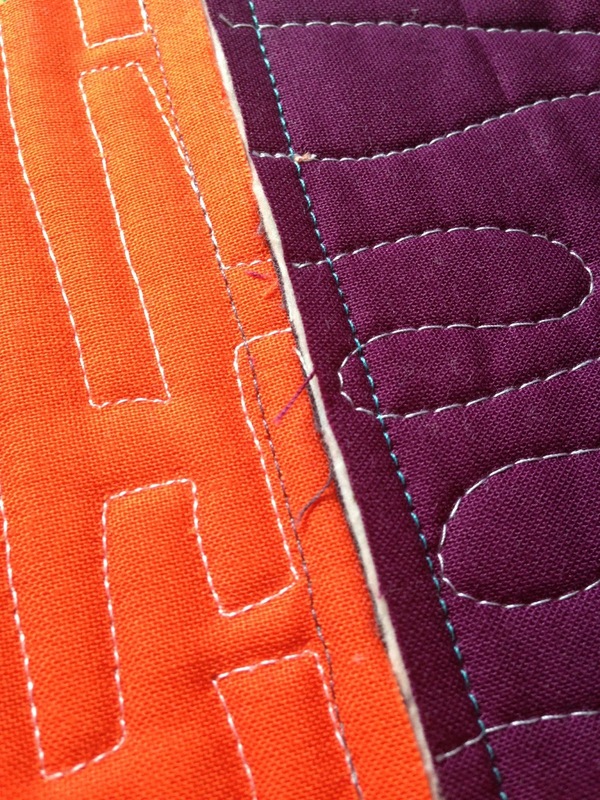 My crappy hand stitching does not have to be brought into play, LOL. Thanks for the very clear instructions Christina! 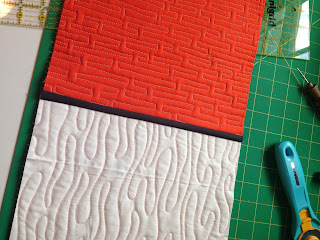 I love how your FMQ samples look when sewn together. 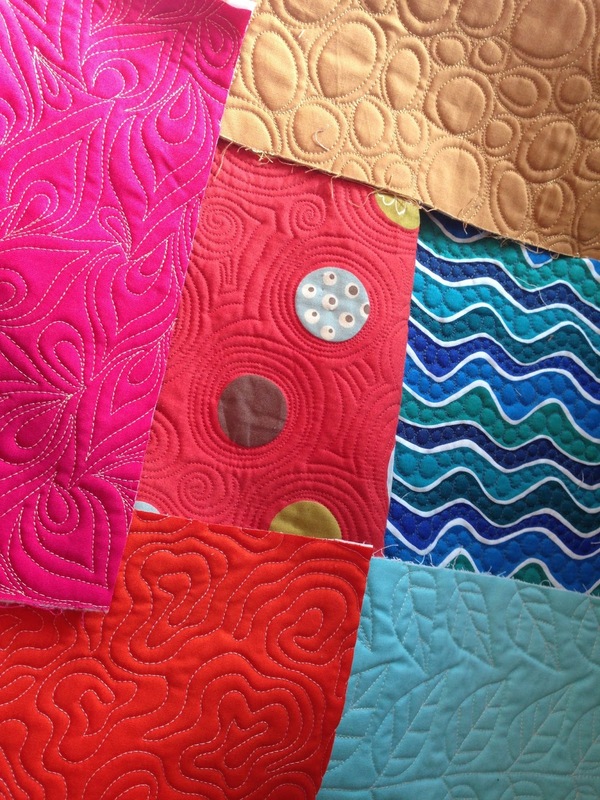 I loved seeing you create that quilt from samples, etc. 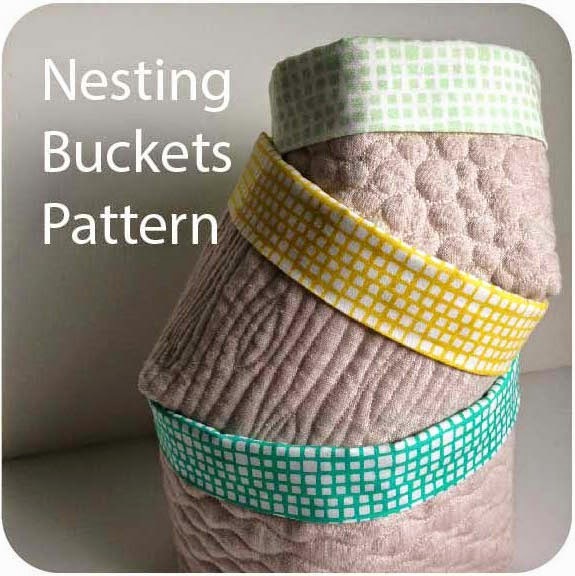 Great idea and it's reversible! Another great stop on our blog hop! 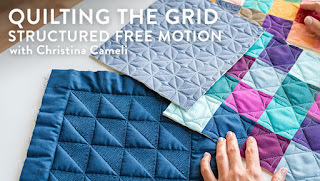 The completed quilt you show at the end looks really cute. I love all the different textures. Lovely quilting! Love the sampler. 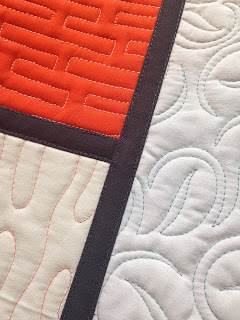 BTW... just wanted to let you know I just today mentioned your Sprocket Quilt in blog entry. I am working on it from time to time. Oh thank you so much! I can not do a lot of hand sewing do to arthritis. Your method is perfect.